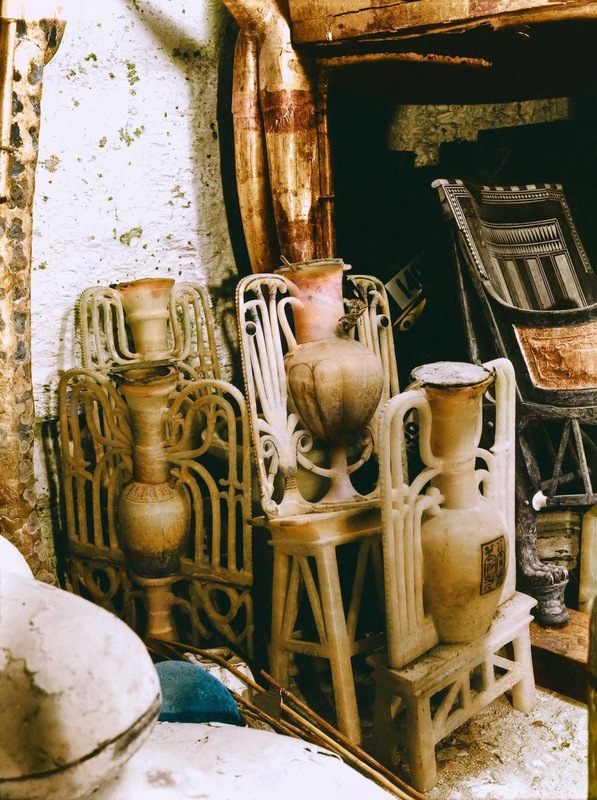 During the early twentieth century, Howard Carter, a British Egyptologist, excavated for many years in the Valley of the Kings—a royal burial ground located on the west bank of the ancient city of Thebes, Egypt. 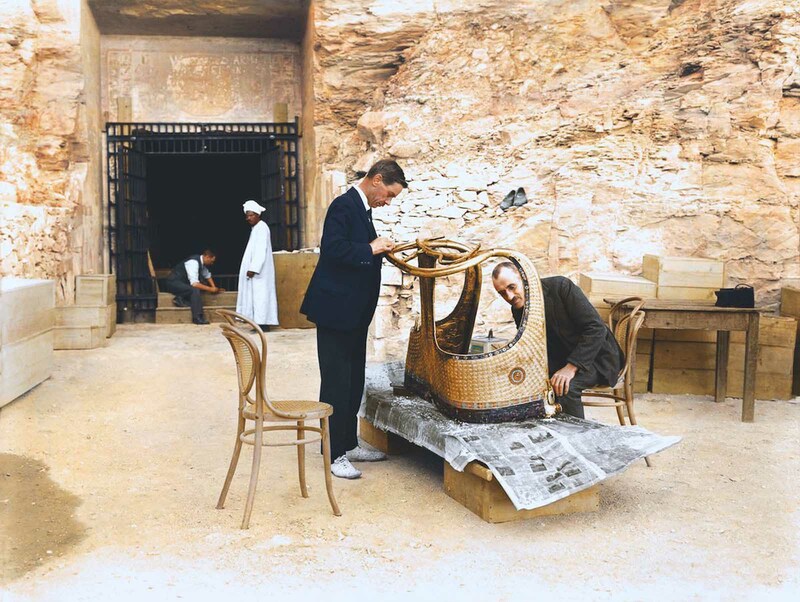 When Carter arrived in Egypt in 1891, he became convinced there was at least one undiscovered tomb–that of the little known Tutankhamen, or King Tut, who lived around 1400 B.C. and died when he was still a teenager. 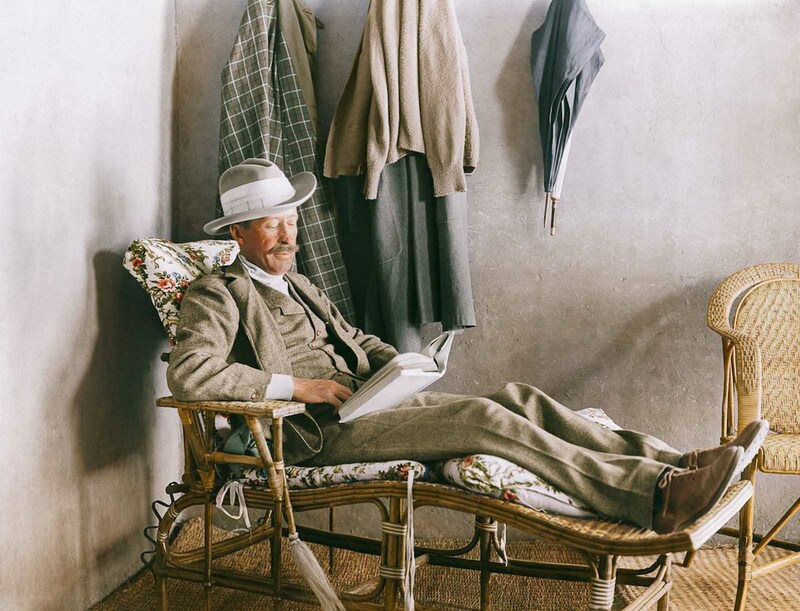 Backed by a rich Brit, Lord Carnarvon, Carter searched for five years without success. In early 1922, Lord Carnarvon wanted to call off the search, but Carter convinced him to hold on one more year. 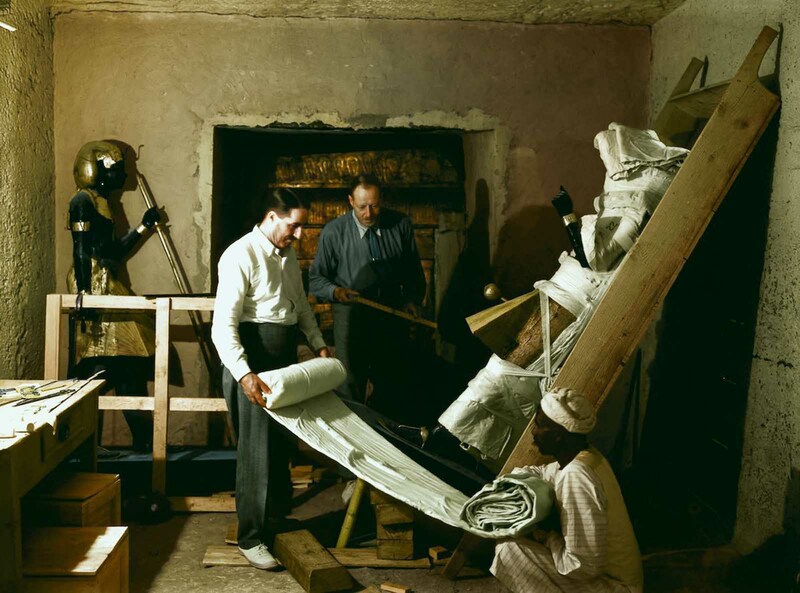 Finally the wait paid off when Carter came upon the first of twelve steps of the entrance that led to the tomb of Tutankhamun. He quickly recovered the steps and sent a telegram to Carnarvon in England so they could open the tomb together. Carnarvon departed for Egypt immediately and on November 26, 1922, they made a hole in the entrance of the antechamber in order to look in. Carter recalled: “At first I could see nothing, the hot air escaping from the chamber causing the candle flame to flicker, but presently, as my eyes grew accustomed to the lights, details of the room within emerged slowly from the mist, strange animals, statues, and gold –everywhere the glint of gold”. 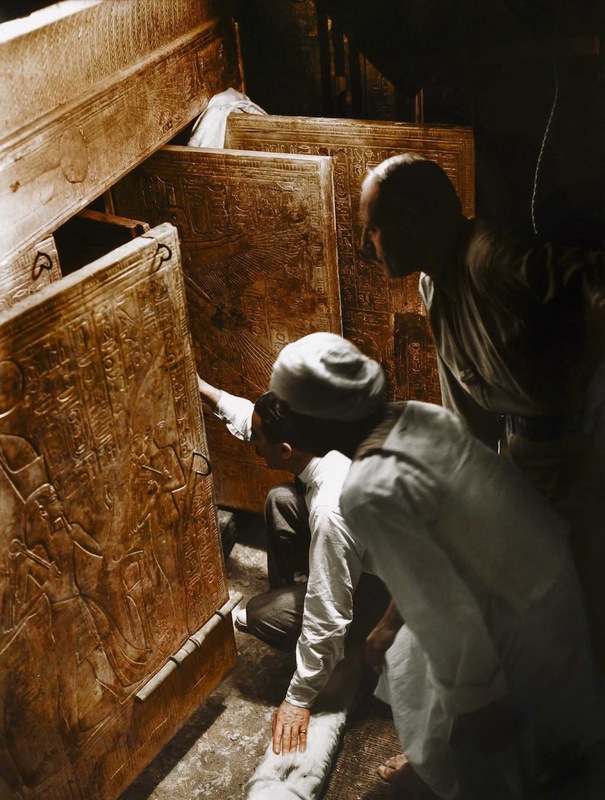 When Carter and Lord Carnarvon entered the tomb’s interior chambers on November 26, they were thrilled to find it virtually intact, with its treasures untouched after more than 3,000 years. 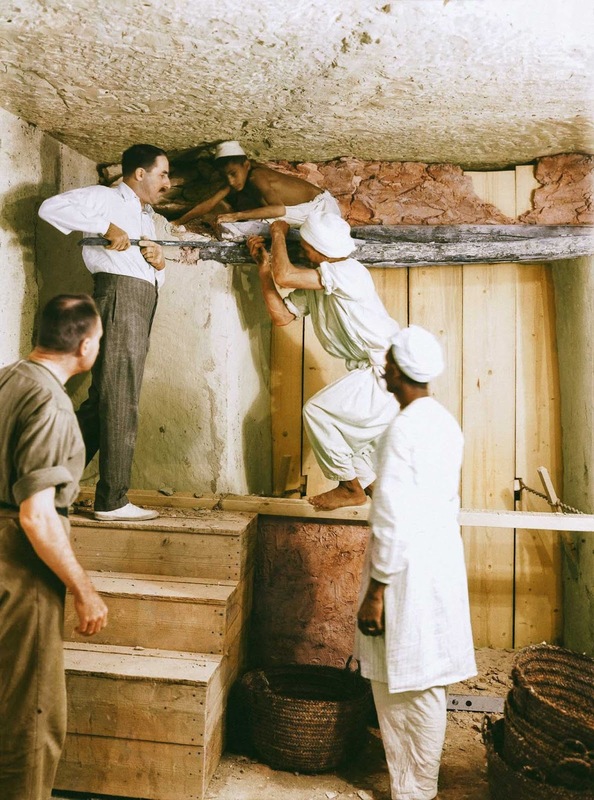 The men began exploring the four rooms of the tomb, and on February 16, 1923, under the watchful eyes of a number of important officials, Carter opened the door to the last chamber. 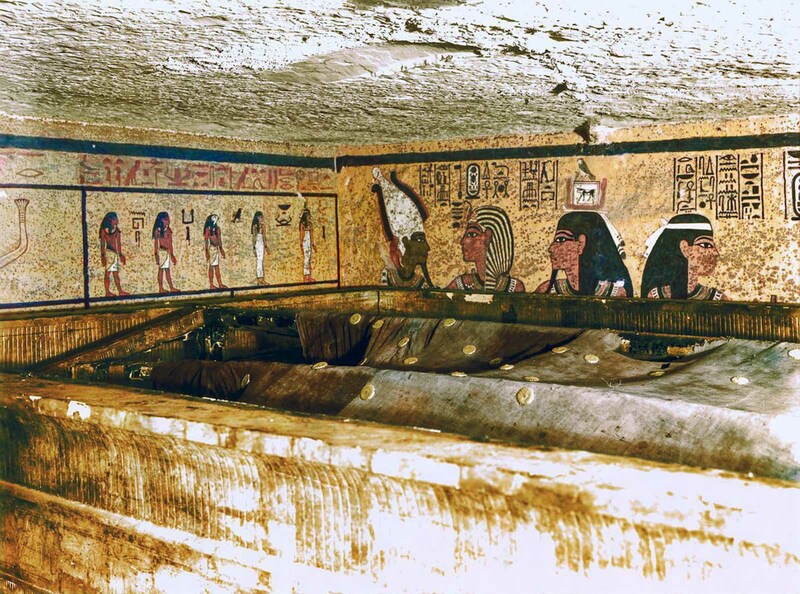 Inside lay a sarcophagus with three coffins nested inside one another. 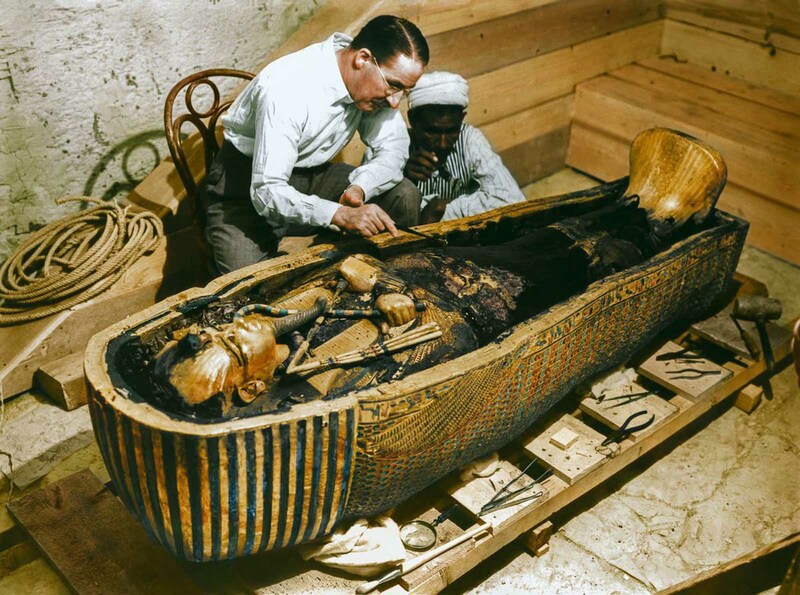 The last coffin, made of solid gold, contained the mummified body of King Tut. 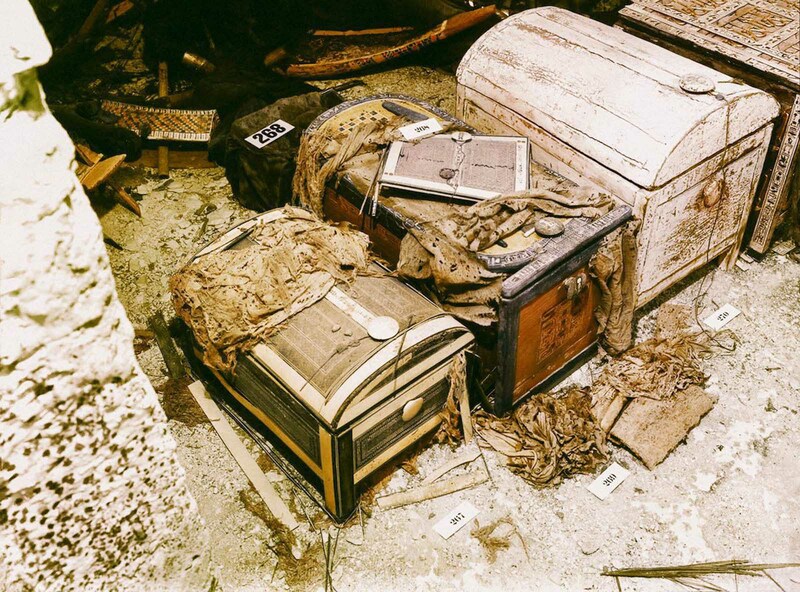 Among the riches found in the tomb–golden shrines, jewelry, statues, a chariot, weapons, clothing–the perfectly preserved mummy was the most valuable, as it was the first one ever to be discovered. 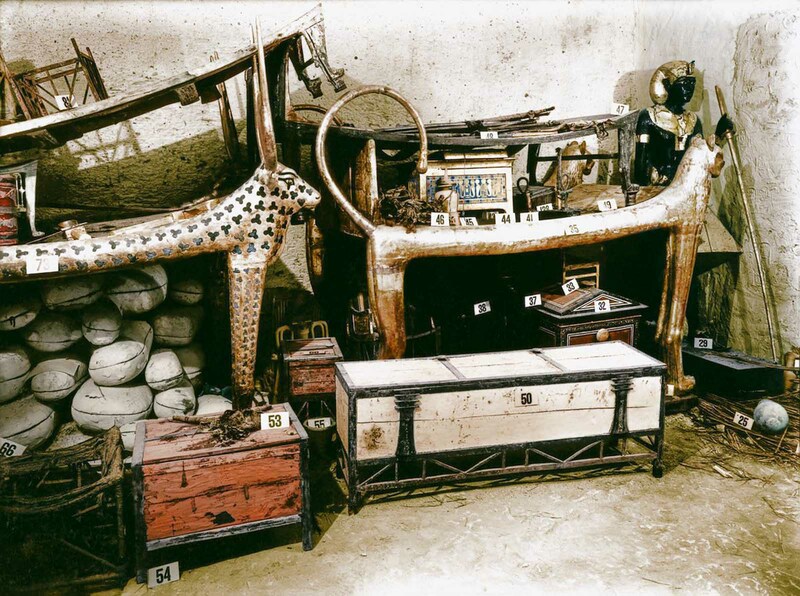 Tutankhamun’s sarcophagus held not one but three coffins in which to hold the body of the king. 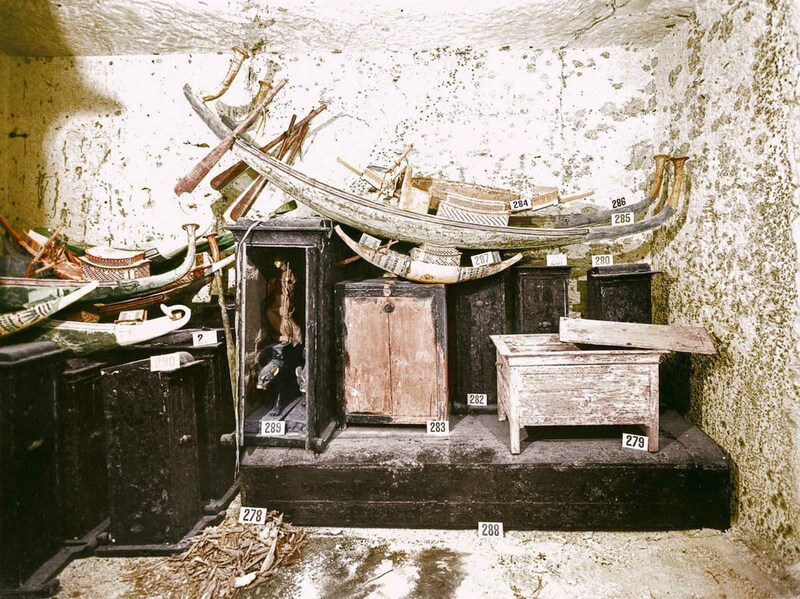 The outer two coffins were crafted in wood and covered in gold along with many semiprecious stones, such as lapis lazuli and turquoise. The inner coffin, however, was made of solid gold. 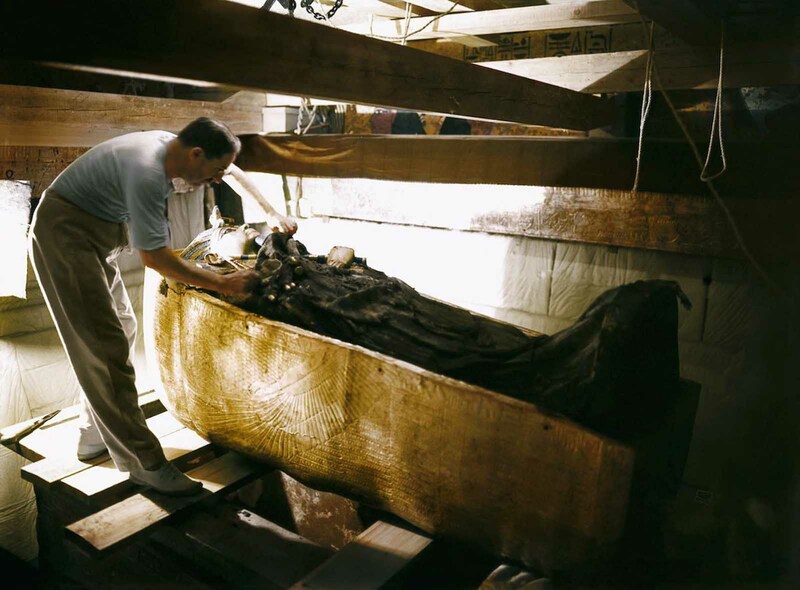 When Howard Carter first came upon this coffin, it was not the shiny golden image we see in the Egyptian museum today. In his excavation notes, Carter states, it was “covered with a thick black pitch-like layer which extended from the hands down to the ankles. This was obviously an anointing liquid which had been poured over the coffin during the burial ceremony and in great quantity (some two buckets full)”. 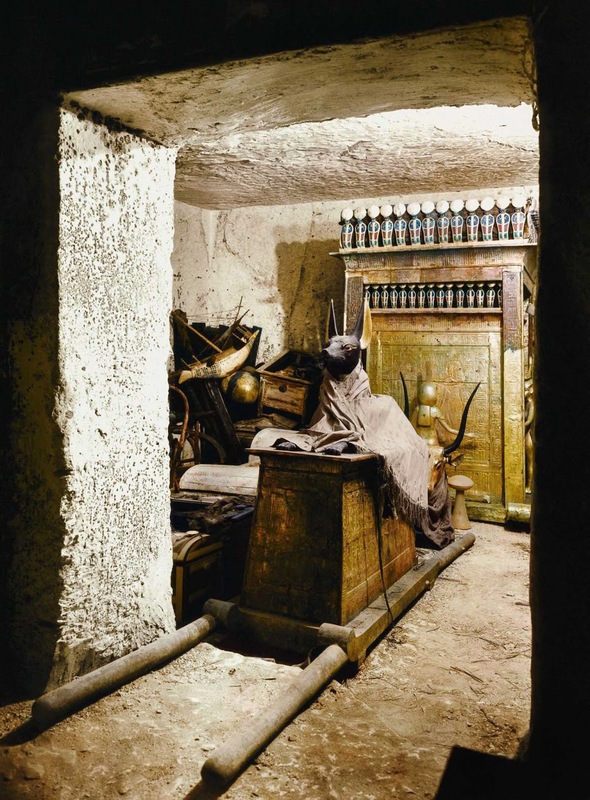 The tomb was robbed at least twice in antiquity, but based on the items taken (including perishable oils and perfumes) and the evidence of restoration of the tomb after the intrusions, it seems clear that these robberies took place within several months at most of the initial burial. Eventually, the location of the tomb was lost because it had come to be buried by stone chips from subsequent tombs, either dumped there or washed there by floods. In the years that followed, some huts for workers were built over the tomb entrance, clearly without anyone’s knowing what lay beneath. 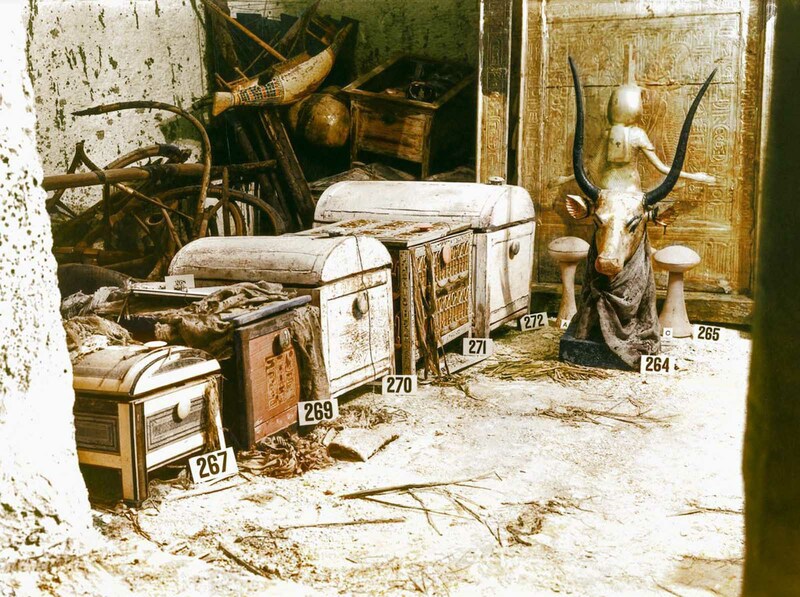 When at the end of the 20th Dynasty the Valley of the Kings burial sites were systematically dismantled, Tutankhamun’s tomb was overlooked, presumably because knowledge of it had been lost, and his name may have been forgotten. 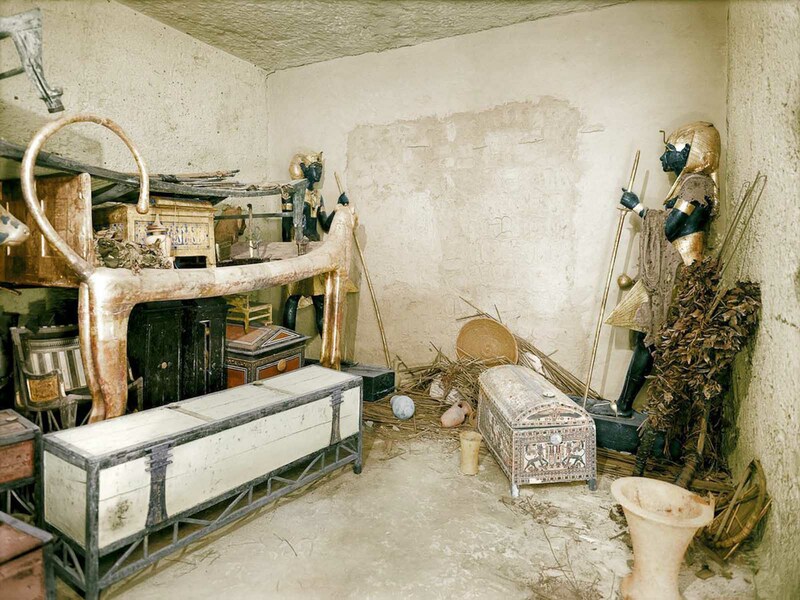 In total 5,398 items were found in the tomb, including a solid gold coffin, face mask, thrones, archery bows, trumpets, a lotus chalice, food, wine, sandals, and fresh linen underwear. 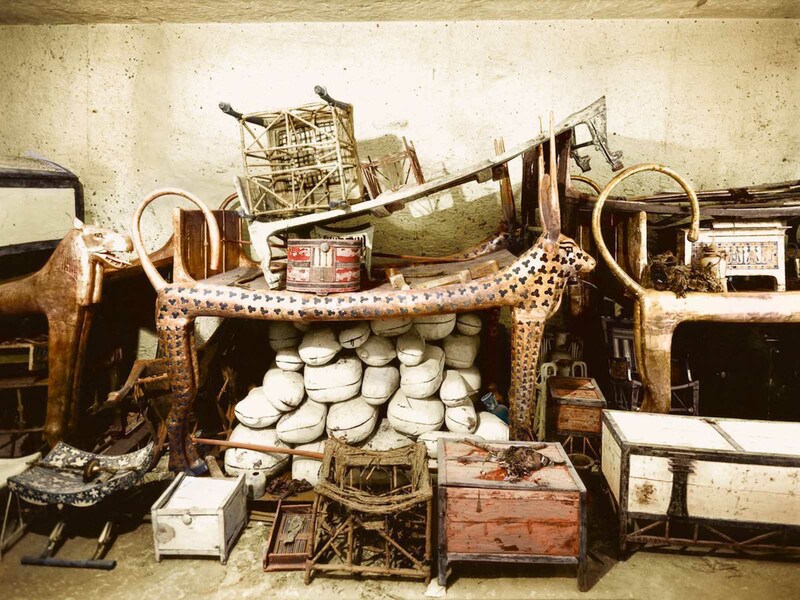 Howard Carter took 10 years to catalog the items. Recent analysis suggests a dagger recovered from the tomb had an iron blade made from a meteorite; study of artifacts of the time including other artifacts from Tutankhamun’s tomb could provide valuable insights into metalworking technologies around the Mediterranean at the time. 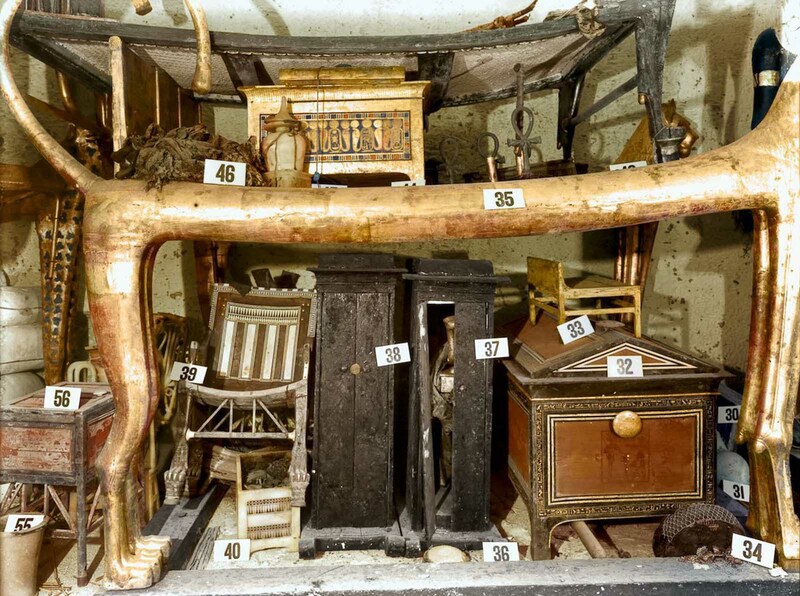 For many years, rumors of a “Curse of the Pharaohs” (probably fueled by newspapers seeking sales at the time of the discovery) persisted, emphasizing the early death of some of those who had entered the tomb. 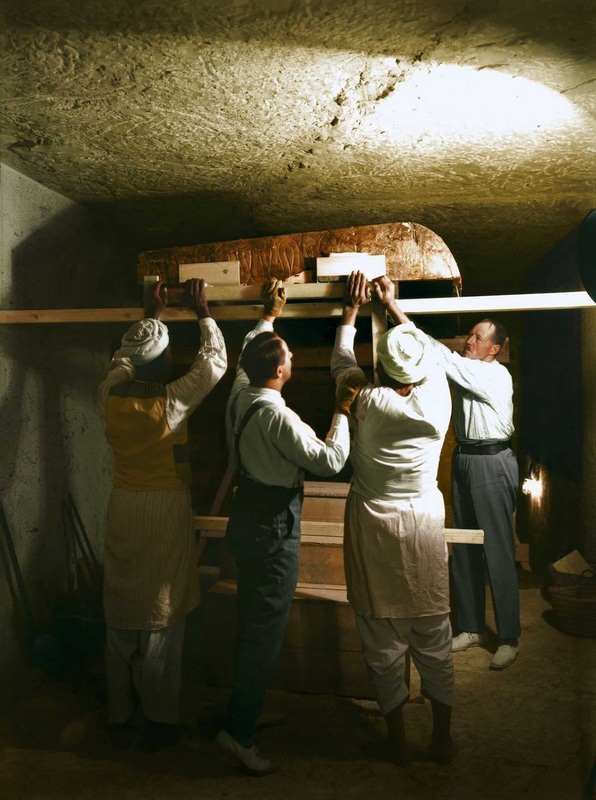 A study showed that of the 58 people who were present when the tomb and sarcophagus were opened, only eight died within a dozen years. All the others were still alive, including Howard Carter, who died of lymphoma in 1939 at the age of 64. The last survivor, American archaeologist J.O. Kinnaman, died in 1961, a full 39 years after the event. (Photo credit: Harry Burton, The Griffith Institute, Oxford. 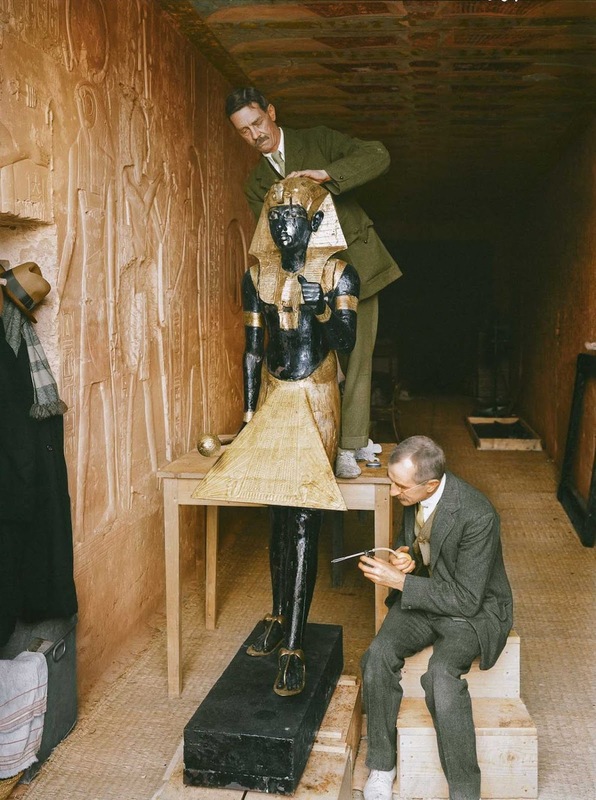 Colorized by Dynamichrome for the exhibition “The Discovery of King Tut” in New York). Think friend. Egyptians wanted to live forever. What other mere mortal person can you think of that legacy has lasted as his has. Old any young know of him and his legacy. I your name is remembered 1000 years after your death, you have attained immortallity. Wonderful pictures and I have seen many others. Thank you !